No other internet radio broadcasting software sounds this good! 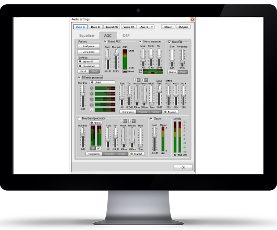 Advanced ACG, gap killing, compressors and limiters to name a few. Easy to set up we integration. Now your listeners can listen to your station and view your library from your website! Even allow your listeners to make requests and dedications! SAM handles large media libraries with easy. Create categories and use smart filters to easily manage your media library. Even update track metadata via Amazon. Do it for fun – or money! Generate revenue from music sales, advertising, merchandising or donations. Earn commission with links that allow visitors to buy music. The SAM Broadcaster Pro built-in advanced audio processor will make your station sound incredible! Features an Equalizer, Gated AGC, Stereo expander, Bass EQ, 5-band processor, 2-band processor and clipper. The multi-band processors contain a Compressor, Expander and Limiter for each band! Get real-time statistics of how many listeners you have in total or on each relay. Instantly see if your listeners like what you are playing or abandoning ship. View the high listener counts so you know what your peak has been for the day. Also get advanced reports on AudioRealm.com as well as extra exposure by being listed on AudioRealm.com. Queue the next song with Dual Deck. 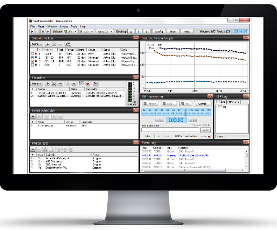 Automate your station to run 24/7, even if you are not there to manage it. Dual Deck players allow you to queue and position the next song while another song is playing – or let Auto DJ take care of it for you. Also allows for professional sounding cross-fading between tracks. The cue channel allows you to preview the songs over headphones before you play it live to the audience. The SAM Broadcaster PRO layout is totally configurable so that it can be set up to fit your style and needs. Have only the windows that you need active. You also have 3 working areas so that you do not need to cram all the windows into one working area. SAM Broadcaster delivers professional sound with cross-fading, gap killer, beat matching, volume normalization and 5-band compressor/limiter. Know instantly how many listeners you have connected in total and per relay and see your totals for the day all on one screen. 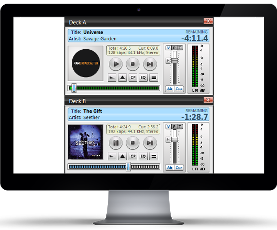 Dual Deck players allow you to queue and position the next song while another song is playing – or let Auto DJ take care of it for you. Also allows for professional sounding cross-fading between tracks. The cue channel allows you to preview the songs over headphones before you play it live to the audience. The crossfader will detect the best time to start fading tracks, or you can manually set the best time.